Many brides in the midst of wedding planning chaos daydream about eloping to a warm, romantic locale. Fair warning - Courtney's wedding may make you drop everything and do just that. 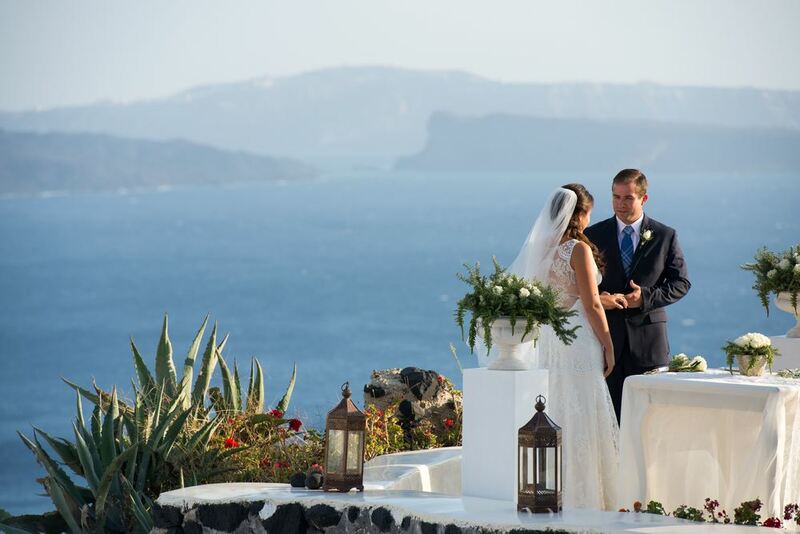 Courtney and her husband Aaron chose the jaw-dropping gorgeous Greek town of Oia on the island of Santorini as the setting for their intimate celebration. Inspired by the blue waters of Santorini, Courtney wore the beautiful Claire Pettibone Iris gown from Little White Dress, a light and ethereal gown with hints of sparkling blue embroidery adorning the gown's delicate lace overlay. We had a chance to hear more from Courtney about her breathtaking wedding and the serendipitous way she found her gown. Now excuse us while we go daydream about hopping on a flight to Greece! Please tell us about your beautiful wedding! What made you and your husband decide to get married in Greece? My husband, Aaron, and I are high school sweethearts and dated for 12 years before we decided to get married so there were a lot of people that have been there for us throughout our relationship. We wanted to have a smaller wedding and with my large family and all of our friends, it would have been incredibly challenging to decide on a small guest list. We decided to choose where we wanted to have our honeymoon and elope with the help of two of our best friends. We choose a town called Oia on Santorini, one of the Greek islands. We got married in an intimate ceremony at sunset on a cliff facing the caldera, and it was everything we could have hoped for and more. The ceremony was beautifully done in Greek and in English, but one of my favorite parts was participating in the crowning tradition. Two wedding crowns were placed on our heads and our friends interchanged them three times to seal our union. The crowns are joined by a ribbon and symbolize the establishment of us as the King and Queen of our home, which is to be ruled with wisdom, justice and integrity. How did you choose your wedding dress? Were you specifically looking for a Claire Pettibone gown? It was quite serendipitous, actually. When we first got engaged I started perusing wedding designers and dresses online. Once I saw Claire Pettibone's newest collection, I was in love and determined to find the Iris gown. I was looking for Denver bridal shops that carried Claire Pettibone gowns and discovered that Little White Dress, which was six blocks from our house, not only carried the gowns but was having a trunk show for Claire's newest collection and Claire would be attending! There were so many beautiful gowns, but nothing compared to Iris. The lace detail was stunning, it was light enough for our Santorini setting and there was the smallest hint of light blue in some of the stitching which played beautifully off of the crystal clear waters of Oia. Do you have any advice for brides in the process of choosing their wedding dress? It was helpful for me to narrow it down to one designer whose esthetic I fell in love with. I can be indecisive and if I would have tried on a hundred dresses from various designers in different silhouettes I would have never been able to make a decision. It sounds cliche, but when I put on my dress, I just knew it was the right one. Do you love Courtney's destination wedding style? A wonderful selection of Claire Pettibone gowns, including the Iris gown, are available year round at Little White Dress Bridal Shop in Denver, Colorado. Call 303-814-8972 or visit our website to schedule your appointment!